Morris Sheppard has been designing and making furniture for over 25 years. He is a graduate of Pratt Institute with a degree in Industrial Design. His work, which brings the sculptor's mastery of form to furniture, is held in many public and private collections, including The Los Angeles County Museum of Art and Harvey Mudd College, and has been exhibited at The Oakland Museum, The Monterey Peninsula Museum of Art, Richmond Museum, Kohler Art Center, Pasadena Museum, and The California Museum of Science and Industry. Private collectors include Jerry Leiber, Neil Young, Warren Beatty, Bert Schneider, Del Chase, Herb Alpert and recently Barbra Streisand. He has written and lectured extensively in the United States and Europe and has taught in the California Community College System. He was the fourth American furniture artist, and the youngest, to receive a fellowship from The National Endowment for the Arts. Sheppard is recognized as an expert on the work of Charles and Henry Greene, whose premier work is the Gamble House in Pasadena, California. Restoration of the Gamble House was conducted with his participation and he is the only person the Los Angeles County Museum of Art permits to measure and duplicate the Greene brothers' chairs in their collection. In recognition of Sheppard's contemporary work, he received the 1999 American Design Exhibition (ADEX) Award for Design Excellence. 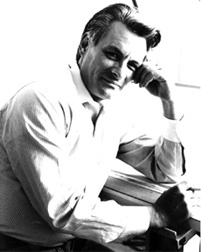 His lighting fixture designs have been placed into production, notably in work done for Robert Long, Inc. Sheppard has a scholarly knowledge of furniture design and classical techniques of furniture manufacturing. He has carried these into the twenty-first century through his extensive experience with traditional hand tools for woodworking and efficient modern machinery. The majority of our work is done on commission and includes all types of residential furniture, entertainment centers and special interior installations. We have also done several commercial installations and major conference tables. Interior design service is also available as an adjunct to our craft. We work directly with clients and through architects and interior designers. Please contact us for more information. Everything begins with the design process, taking into regard both the functional and aesthetic considerations of the piece at hand. The design process does not stop at the drawing board, but continues right up until the final decisions are made in the wood itself. Each piece is made with as much care and technical integrity as possible. It is the nature of wood to be responsive to changes in atmospheric moisture and hence constantly in motion. This must be accounted for. All detail work is carved by hand, using both power carving tools and traditional gouges and rifflers. Even though utmost care is taken to "find the line" pieces will vary slightly from one side to the other and no two pieces - even chairs in a set - are exactly identical. This adds a warmth and variety otherwise impossible to obtain. Our workshop, while compact enough to give everything we make individual attention, has the space and facilities to handle projects of any scope. Morris has lectured at many colleges, museums and universities, including Boston College, San Diego State University, UC Riverside, Long Beach State College, London Crafts Guild, Malmstens Verkstatdscoler, Stockholm, Sweden, and the Philadelphia College of Art. 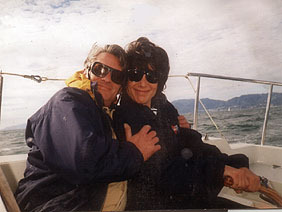 They enjoy sailing and living in Marina del Rey, California.